Every blogger comes to a stage when he starts feeling that he needs to raise the level of blogging. In such a situation there arises a demand for a redesign. Few days back even I started thinking that way. The reason behind this redesign was the feedback I received in terms of traffic for the posts I’ve written. I felt the articles are quite unique, but still I wasn’t getting the amount of traffic which I expected. Then I went into the research mode to find the cause of this problem. Then it struck my mind that the main thing which is missing currently is an eye catching layout. Being a Web Designer I could’ve easily tweaked the current theme’s design a bit to make it look more elegant. But I wanted to go the long way & design my theme from Scratch. Yes, it certainly is time consuming. To be frank enough, it’s completely different from the way you design site’s for your clients. When you are working on your client’s site; then the client obviously describes how he wants the site to look. But when you are designing one of your own sites, then it’s not an easy job; believe me. I will write a separate post regarding the difficulties I faced while redesigning DailyBlogging. 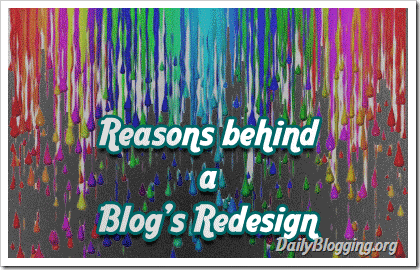 For now, lets continue with the 5 Reasons you would consider when you plan to redesign your blog. Some Bloggers redesign their blog when they get into bigger partnerships, sign new sponsors,etc. It shows signs of raising the bar/level of blogging. But once you redesign your blog due to this reason, then you should clearly inform it to your readers. Today, there are many bloggers around the globe. But only a selected bunch of them become successful. New & aspiring bloggers blog for a month or two & then they feel that a change in the design could bring in more success to him than other blogs. Most of the times such bloggers attempt to copy famous blog’s themes or skins. But one should not forget that success of a blog is not in terms of money, but in terms of the feedback a blog owner gets from his readers. SEO is what every blogger wants, so that the unique content he writes gets easily discovered by a searcher. It’s not compulsory that every theme/framework would promise a better SEO. It all depends on how you use the services/options provided by the theme. This is the basic reason behind every redesign. It’s pretty difficult to obtain a combo of both Elegancy & Professionalism in a single Design. But if you want your readers and visitors to stick to your website for a longer period then you need such an eye-catching design. These 5 points are the very basic yet major reasons behind every blog’s redesign. There are many other factors, but those are just minor one’s. 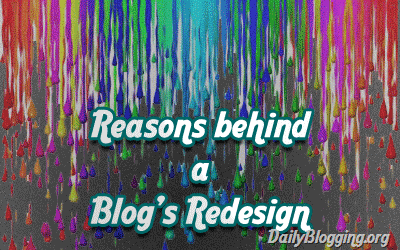 How many times have you redesigned your blog ?? I didnt get why to use Elegant? thanks!!! for the reasons which i was telling to my client now i can show this post bravely …..
It’s good also to redesign your blog after some time to give it a refreshing new look. I always redesign my blog to give fresh look. I am gonna change my site’s theme as many of them said it isn’t good. And I too feel it. hi mani viswanathan, these 5 tips would be helpful for me to redesign the blog…. and these type of article to boost up to redesign the blog.. The most Productive reason I would redesign my blog is to give it more elegant and professional look as everyone wants to! Thanks for sharing such informative ideas!